March. Oh March. Where did you go? As the weeks fly by and we get closer to baby #3, our days get fuller and fuller. Our life margin is as narrow as it's ever been. But life feels abundant and wonderfully good. If you know me (or my mother), you know I'm a woman of lists. They help me settle my ADD brain and make life manageable on paper. I've created a couple lists for these last 8 weeks and 3 days until our son is scheduled to arrive (who's counting?). One list for work seems impossibly long. The other list for personal projects is just called "Ticking time bomb tasks...". Last month we crossed off a number of HUGE tasks including buy a minivan, sell a Honda, file taxes, finish paperwork for Judah and Addise's legal name change, social security cards and adoption re-finalization, organize the garage and finish registering for my baby shower. There was also about 2 weeks of sickness that invaded our house as we passed around some flu/cold virus. It spared no one. We also had 5 different doctor appointments between the 4.5 of us in a week's time. Glorious. Did I mention all this was on top of growing a baby in my bulging belly, developing two little breathing beings, working full time in a high capacity job, and nurturing my most valuable marriage? Yeah. No margin. Last month was also graced with my parent's presence for the last week of the month. My mom is a picture perfect grandma - present, fun, affectionate, authoritative, teachable, and willing to be bossed around. Judah and Addise LOVE her and wish my parents didn't have to get on an "airplane to go bye-bye". My dad was also here for part of the time and though admittedly not a little kid guy, he found ways to connect with our kiddos - tickling, ongoing jokes, and loud noises - and they adore him. My favorite repetitive moment was Addise refusing to call my dad "grandpa" but insisting his name is "gamma". It started as a teaching experience and turned into hysterical laughter all around. I won't even get into what this month - my month! - looks like other than a master bathroom remodel, hospital tour, have our carpets cleaned, and organizing whatever space isn't 100% utilized in our modest condo so we can accommodate another child and ensuing stuff. The month of May is equally as ambitious. Pregnancy is well...not my favorite. My dad identified that I'm experiencing this pregnancy more as a task to be completed than an emotional journey. It's true. It's hard to do the latter with all the other happening. Currently, my favorite pregnancy symptoms are carpal tunnel, swollen face (especially my nose!) hands and feet, a dozen skin tags, itchy belly, utter exhaustion, compressed lungs that leave me breathless after walking up the stairs, snoring that keeps my dear husband sleepless, red rash around my nose, and waking up to pee or flop into a new position 3-5 times each night. And I may very well gain 40 pounds in these last 8 weeks. I'm insatiably hungry and munchy. I've also had a couple doctor appointments in the last few weeks that have indicated that my son and I are measuring about 2 weeks ahead of schedule, which either means he's coming early (PLEASE SOVEREIGN JESUS!) or he's going to be huge. Please pray. I'm begging you. Brian was over 8 lbs and his itty-bitty Puerto Rican mother had to push him out. I'm praying for a different end to our story. Otherwise, all is going well in this final trimester. "One and done" - this is the motto of my pregnancy. Judah and Addise are impossibly cute and giggling at their shenanigans after bedtime, sometimes infuriated, often baffled, and ever grateful for their beautiful lives. Here are a few snapshots into this past month. "PIZAZZ!" Is what my mom has aptly identified as Addise's 1-word descriptor. Her newest phrases are "what?!?!? ", "mommy, where's dat?!? ", "come on, mommy", while furiously nodding her head in a sing-song voice - "Ya like it?!?" She's also fond of saying "NO MOMMY" with some undisclosed authority, which is often met with stern discipline and a chance to do-over. Judah's first time constructively contributing to our grocery trip. He thrives on being a helper. I recently submitted this picture to a Gap open casting call which begins next month. I'm whipped over this one. 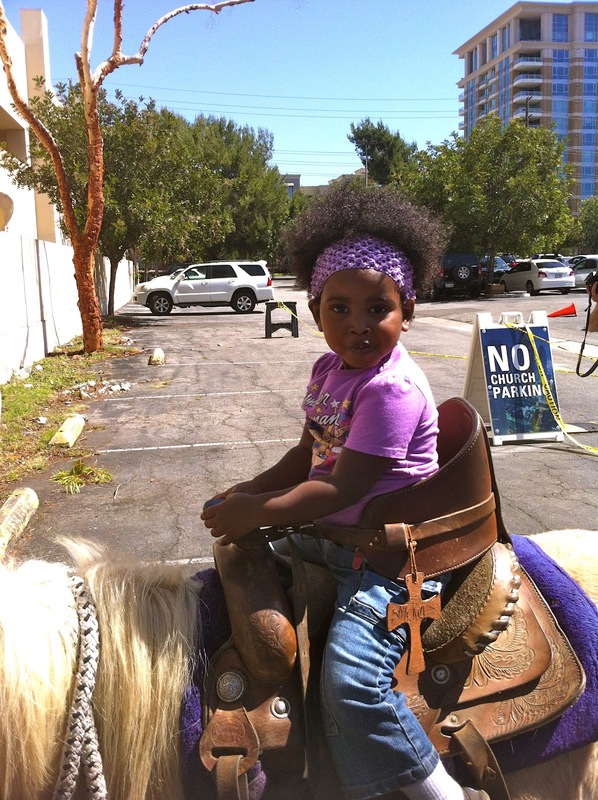 Addise got to ride a horse at a family celebration on Palm Sunday at our church. The cowboy who lead her down the suburban parking lot had her giggling with glee as the horsey galloped. Priceless. BOUNCY! This is a pregnant mother's nightmare as climbing in to said bouncy house to collect her enthralled children is pretty much impossible. Eventually they came out. I don't know why or how. Judah loved chasing and playing with some sheep, goats, bunnies, and chickens in a petting zoo on Palm Sunday. 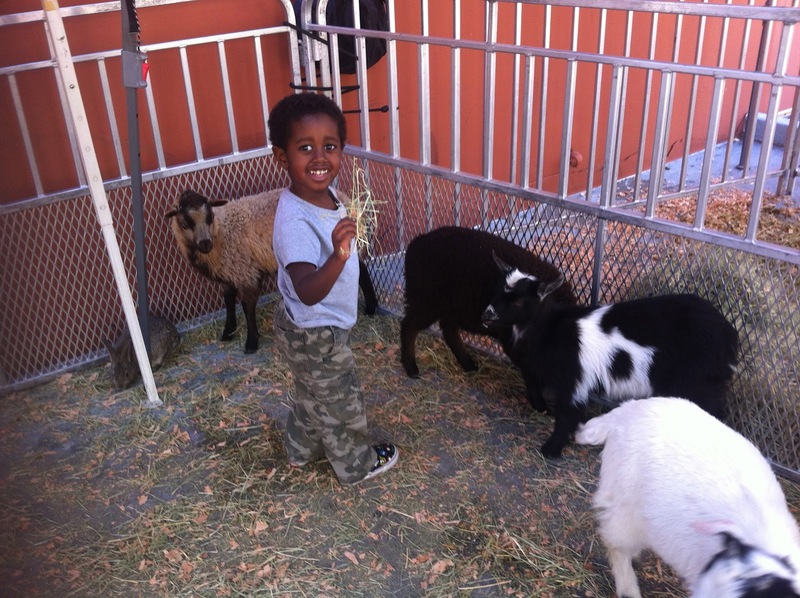 I have to catch my breath when I see my little Ethiopian having these childhood experiences for the first time. The longer he's with us, the more we see his confidence and boldness increasing. It's a reminder that our attachment work is not done. Addise got her grubby hands on 4 freshly washed apples and gnawed into them with her little teeth. She was proud of her achievement. I was not. Trayvon Martin and Judah Diaz.